Okay, I'm lame because I knew none of that. However, I've always found creation stories interesting- Christian, Egyptian, Greek, etc. haha! I think that a good majority of people are not familiar with the Norse stories-- and these least of all! so no worries you are not lame! :) and NOW you know! Hey Amalia, thanks for this—the creation myths were not part of my researches, so this was all new to me! Very cool stuff! Glad you enjoyed it! 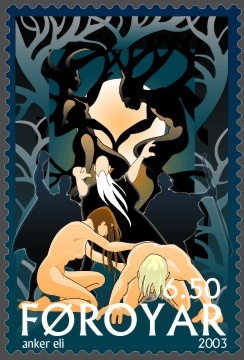 I'll confess that I mostly just wanted an excuse to show off the imagery of that stamp. The Norse Creation myth is really amazing-- I definitely suggest giving it a read! That is one gorgeous stamp - worthy of framing. I am awed by the sheer number of creation myths, this one is particularly interesting because of the ties to the sea. That and the fact it's totally new to me. :) Looking forward to hearing what the Norse have to say about M-A-N. When I saw it, VR, I really really really wished I hadn't given up stamp collecting and could get my hands on one. Or that someone would turn it into a poster for me. I absolutely adore it! That's so interesting, I love the way they come from the water too! I'm fond of the Greek creation story, myself. Your posts always remind me that I mean to study more myths from other cultures more often, Amalia! I kind of skipped the very very beginning of the Norse myth. I need to reread the Greek! Mia: I wonder if it's purposeful. I can't decide if it is or not from the sources. How interesting, especially because I'm reading Joseph Campbell's "The Masks of God" and all the resemblances between different mythologies come to mind. I hope he'll cover Northern mythology on Vol. 3. I'm on Vol. 2 - Oriental Mythology. Fantastic!